Mark Townsend, war correspondent, describes the air war in Afghanistan from his first-hand experiences embedded with British forces. This is a Hush-Kit exclusive. In a war where the most lethal threat is buried underground, Afghanistan’s airborne operations are often obscured behind the escalating roll call of IED victims. Yet visitors to Helmand Province are quickly reminded that, like all modern campaigns, almost everything relies on what’s happening above. To move safety across landmine sown terrain, to guarantee the outcome of skirmishes and acquire intelligence of enemy strongholds depends upon air supremacy. In fact, to get anywhere near the province you’ll need wings. The first aircraft you’re likely to experience is the C-130 Hercules, rumbling south from Kabul to the sprawling US base outside Kandahar or further on to the UK’s shrunken versions in Camp Bastionor Lashkar Gar. Helmand is still several miles below when the flight crew gestures –despite ear plugs the engine noise is deafening – for all passengers to don flak jacket and helmet. Now the descent. Hard and fast. Anti-missile devices on, the engine’s drone is higher now, the aircraft’s slumbering frame suddenly feels oddly nimble, its nose pointed at the ground at an angle civilian flight has never prepared you for. But then most flight time above Afghanistan is akin to a roller-coaster. 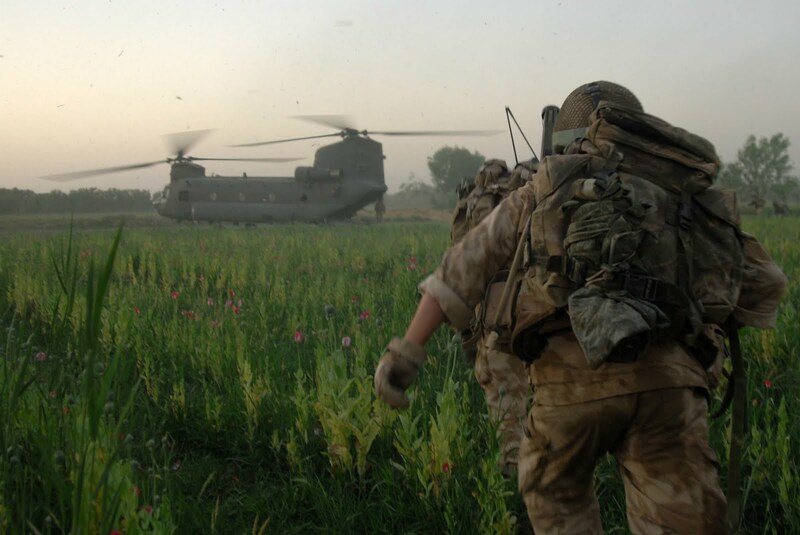 Although the Chinook is regarded as the aviation workhorse of the British army, its moth-like body churning furiously through the hot Helmand sky, I only remember it as a jittery fairground ride of never-ending dips and rolls. The exception, perhaps, being the 20-minute hop from Camp Bastion to Lashkar Gar, often a smooth affair, its load sprinkled with stern and sensible-faced reconstruction officials and diplomats. But head north from Bastion to, say, Sangin and movement by Chinook becomes a very different prospect. You already suspect as much before you’re on board. The helicopter’s landing gear has barely touched the tarmac when the command is issued to move forward, you stumble towards its ramp, suffocated by the eyebrow-singeing heat of its two side-mounted engines. Seasoned soldiers gasp for breath, bodies bent into the draught from its spinning rotors. You’ve hardly had time to wriggle into the delicate mesh seats when the rear gunner gives the thumbs up. Then you’re up,over the perimeter fence, above the first wadi, the first cluster of Afghan compounds. Goats stare up, kids wave and you can see their smile and you guess the helicopter is no higher than 300 feet before you start lowering. The Chinook banks hard to the left, then right,you lurch forward, suspended by the flimsy safety harness as the Chinnok follows a wadi north east to Sangin. By now, you’re no more than 50 feet above the surface, its desiccated banks in line with the helicopter’s belly. You gasp as the Chinook banks furiously again, pushing you deep into the harness. You raise an eyebrow at the young soldiers sat opposite, to say ‘this is some ride,’ but there is no acknowledgement. No one is smiling. Some swallow hard and grasp their rifles, some stare at the receding desert flats out of the open rear, others through the dust-smeared viewing port-holes. You remember they are off to war and some must surely be worried they might not travel back alive, or otherwise on their back lying on the floor of the medevac Chinook,wired up to a saline drip as medics battle to keep them from slipping under. Some probably just hate flying. Others, too, would avoid the Big Dipper given the chance. Flight time is no more than 25 minutes of lurching forward and back, occasionally the helicopter interior filling with a backdraught of dust and fume-filled air. And then the final approach. 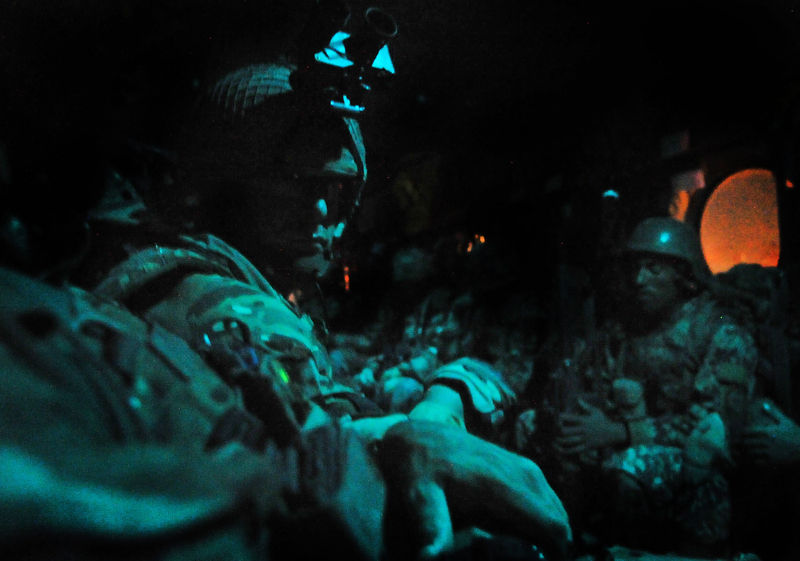 Suddenly, we’re climbing – below, the blue strip of the Helmand River – and then as quickly we’re dropping quickly through the “fire zone” where the enemy have recently aimed ground-to-air rockets at approaching choppers. The Hesco barrier marking the outer wall of the British army’s Sangin forward operating base, blurs past below. The soldiers opposite are all now gripping their SA80’s, eyes widened. The Chinook lands with a jolt, blades still whirling, helicopter trembling and we’re running out through the wall of heat and noise into a dust-storm. As the last boot leaps from the lamp, the Chinook is already rising, swinging around to the river. There are other ways to ride a Chinook. Keep heading further north from Sangin to the remote base of Kajaki, submerged between jagged mountain ranges, and the journey changes. This time, the Chinook chugs slowly to 9,000 feet and for those prone to vertigo, the sight of endless peaks through the helicopter’s open rear presents a terrible urge to hurl oneself to the battlefield far below. Again, as always, it is the descent that is most hairy. This time the helicopter weaves through a valley whose sides tower above. It is a vulnerable passage of flight. As the craft approaches the landing zone, it passes below the wreckage of another Chinook, struck weeks earlier by a Stinger missile. And again, the expressions of the soldiers opposite never change, fear is a redundant emotion for airborne ground troops. Yet while Chinooks provide their safe passage, it is the sight of another helicopter in the cloudless Helmand skies that unfailingly lifts the spirit of NATO’s infantry. 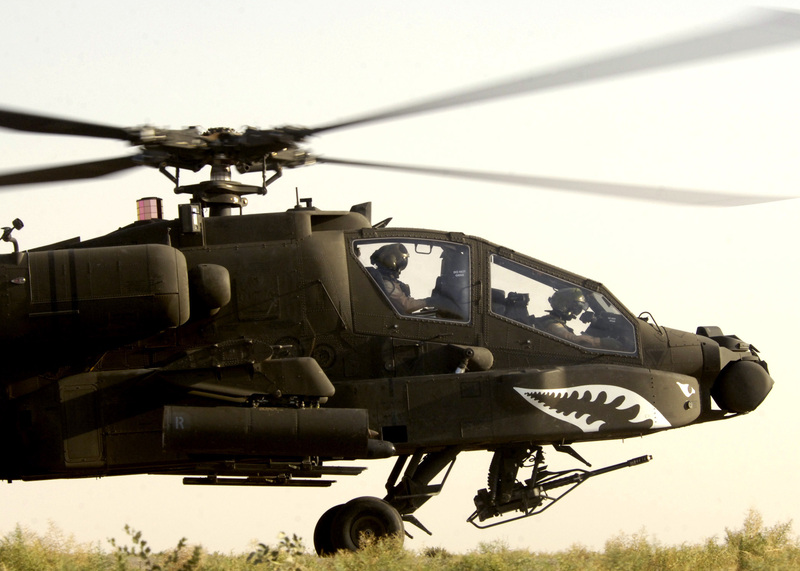 The AH-64 Apache is their saviour. Its appearance, like a fuming firefly, is invariably a sign that the fighting in question will come to an end, its mere appearance usually sufficient for the Taliban to retreat. 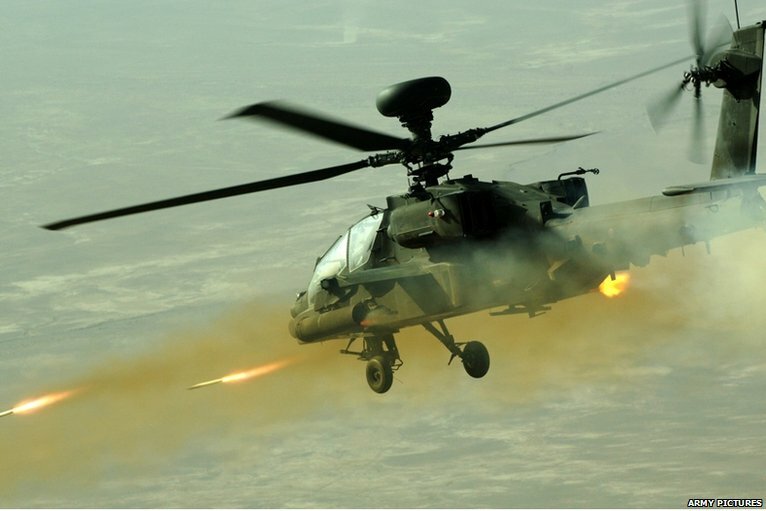 Those who have seen the Apache in action will testify its ability to hang in the air, clinically despatching laser-guided Hellfire missiles at pre-selected firing points. It is a merciless machine. Within several days in Helmand it was evident that the Apache’s arrival always guaranteed victory or at least a successful retreat. And that’s Helmand: you spend the whole time worrying about what lies beneath while waiting for something to appear in the sky.